The Innovation Connector has been busy preparing for the BIG Idea Pitch competition and the Excellence in Innovation Awards. Our role has been to work closely with Ted Baker and his team on coordinating all marketing materials. 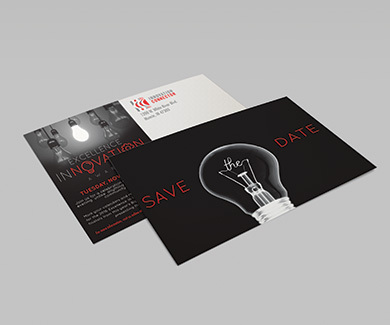 One piece in particular that we enjoyed creating was the Save the Date for the Excellence in Innovation Awards. This piece incorporates the theme of the lightbulb as seen in the logo. We used the same design elements from last year’s invitation but with a refreshed look. Instead of a reversed out white background, we chose to illuminate the lightbulb on a black background by adding a shimmer paper stock. This resulted in a piece that could not be ignored!  RealAmerica came to WSS in need of a marketing piece they could use to showcase the specific property types, development and property management services that they offer. They wanted something attractive, concise and informational. 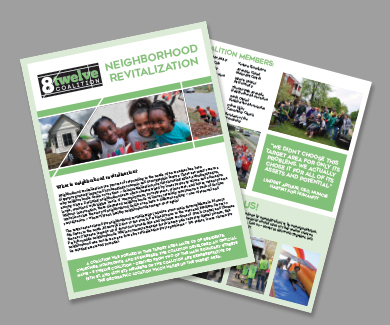 WSS worked with RealAmerica to design an 8-page, 8 ½ x 11 booklet with a front and back cover. 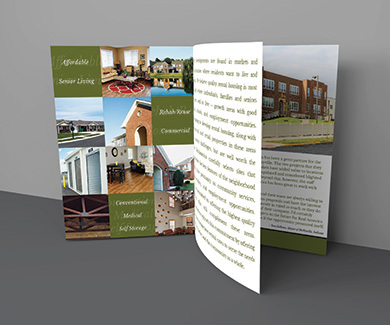 We included a pocket on the back inside cover for inserting other print pieces as needed to customize the information they present to potential clients or investors. Muncie Habitat for Humanity is a part of the 8 Twelve Coalition which is working on a great project for our community – Neighborhood Revitalization! This project consists of several individuals and organizations in the community focusing on one area, in this instance the area between 8th Street and Memorial Drive, to revitalize the distressed homes in the neighborhood. Over the last year, the Coalition has made some great progress in the area, but they didn’t have a piece to really tell their story. WSS designed a piece that contained an explanation of Neighborhood Revitalization, core areas of focus, and pictures of areas they have impacted so far. This piece will be used to update current stakeholders on the success of the Coalition, and it will also be a way to show others why they should support this cause.